Due Date for Storybook Character Sculpt-a-long! Please post your final pictures in the comments to this post before May 20th 2018 to be eligible for a prize in our sculpt-a-long. I have a number of dollmaking books and magazines to give away. The best finished piece on May 20th will receive a prize. If you aren’t done yet, don’t worry. We’ll have a second chance date on June 10th. Have the costumes on your storybook doll finished by May 6th. This is our second-to-last check-in date, so I hope we’re all happy with the progress. Post a picture of your work-in-progress in the comments to this post. April 15th might be better known as the tax deadline, but for us it’s the target date to finish our doll bodies. Please post pictures of your work-in-progress in the comments below. Just a reminder: the final date for a finished piece is May 20th. Your chances of finishing on time are better if you keep up with the work in the meantime, but judging and prizes will be based on a finished doll on May 20th so don’t be upset if you miss a check-in date. We will also have a later date for people who want to continue playing. Whoops, no one has posted for the head yet, not even me! Not to fear, we are going to have plenty of time to catch up in the end. We’ve decided not to adjust the schedule for now, but to add some catch up dates at the end for the latecomers to finish up. April 2nd is the date to show hands. Please post a picture of the hands of your doll in the comments to this post. And as always, feel free to go back to the earlier posts even if the date has passed. The prizes will go to those who finish on time, but the fun is available to everyone. March 18, 2018: the head. The head is arguably the most important part of the doll. The expression on the face can make or break what you are working on. Got some tips or want advice on some challenges? Let us know. Please post a picture of your work in a comment to this post by the deadline. Familiar names Forrest Rogers and Virginie Ropars are among the artists who have been selected to appear in the 25th annual Spectrum: The Best in Contemporary Fantastic Art. If you aren’t familiar with this book series, it is a year book that celebrates the best of fantasy art. It includes the full span of 2d and 3d art, traditional and digital media, published and well known art and unpublished art by relative newcomers. It has generally included doll art every year. You can learn more about it at their website. 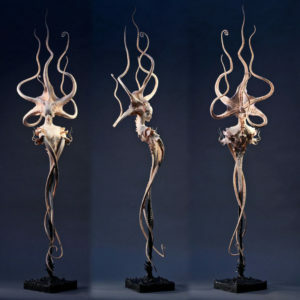 The photo is Octopoid Descending, by Forest Rogers. Many of you are probably aware of Lisa Lichtenfels amazing work. You may also be aware that last year she had breast cancer at the same time she lost her husband. She’s recovering well from the cancer, but has developed arthritis that is making resuming work difficult. Lisa’s artwork is incredible, but when I met her I was so impressed with her as an individual my overwhelming impression was that I would have been just as impressed with her no matter what she did. But the artwork! They are often mistaken for photos of real people, but they are built with layers of batting over metal armatures. Her dolls have souls. If you aren’t familiar with her work, you can find pictures at http://lisalichtenfels.net. Connie Smith just posted an update on the gofundme she started to help support Lisa. Lisa has started to work again, but it’s tough and her house needs many repairs that were delayed for years. Hello doll makers! March 4, 2018 is our next checkpoint. By next week, you should have your armature and/or pattern finished. I’m assuming nearly all dolls will use either an armature (sculpted dolls) or a pattern (cloth dolls.) If this assumption doesn’t work for your particular method, then do whatever you need to get a good start on your own piece. When you post a picture, let us know if you are looking for feedback or simply sharing. If you haven’t joined us yet, there’s still plenty of time. Feel free to jump in late and play along. The dollmakers email discussion list began in 1996. The archive doesn’t go all the way back to the beginning because of server migrations, but our archive of discussions and dollmaking tips goes back to 2002. We’ve had members ranging from world-famous artists including NIADA members Marlaine Verhelst and Jodi Creager to brand new members asking tons of questions. We focus more on original sculpted dolls, but we do have cloth artists and the occasional discussion on porcelain molds. We would love to get some new members on the list so we look forward to meeting you. If you are interested in joining, click here for the form to join. Once you’ve joined, you have access to the 16 years worth of discussion archives with its wealth of information. Our first checkpoint is coming up on Sunday, Feb. 18, 2018, but this is a small one. For the first piece, we just need to decide what we are doing and make our plans. This might be a paragraph, or it might be a sketch, or maybe both. Decide on the character you are making and start thinking about it. Post something as a comment to this post. Let us know what story you are using as inspiration. Please tell us if you are looking for feedback or not. Starting a piece with a sketch is a great idea. It’s easier to change a sketch than to spend hours sculpting only to realize you don’t like something. If you draw your sketch to scale, you can use it as a tool for laying out your doll.